A cloud is a visible collection of condensed water vapor or ice crystals located within the atmosphere. Clouds form only when there is sufficient humidity to form droplets or crystals upon a suitable quantity of microscopic particles (called an aerosol). Particle types include sand, pollen, spores, smoke, exhaust pollutants, and sea salt. But the formation of so-called “night shining”or ‘noctilucent’ clouds (NLCs) requires something special. Noctilucent clouds are sometimes (especially in scientific circles) called polar mesospheric clouds (PMCs) – their appearance is striking. Their altitude is remarkable. They reside an amazing 50 miles above Earth’s surface. By comparison, cumulonimbus (storm) clouds reach elevations of only approximately 15 miles, and cumulus (fair weather) clouds are considerably lower than that – about a mile high. Noctilucent clouds are clearly unique. In fact, there is a “secret ingredient” in their formation – meteor dust. Meteors are pieces of rock and metal (usually iron and nickel) that enter our atmosphere. Traveling at extremely high velocities, the meteors strike nitrogen, oxygen and other atmospheric gas molecules, experiencing incredible friction and as a result, very high temperatures. This forces chemical interaction with the oxygen and other gases, producing the needed aerosol for ice crystal formation. It would be logical to assume metal oxides and silicon dioxide would predominate as constituents of meteor smoke. The logical choices would be iron oxide (Fe2O3) with some nickel oxide (Ni2O3) from the metallic meteors and silicon dioxide (SiO2) from the stony meteors. Others would include hydroxides and carbonates, because of the presence of water and carbon dioxide in the atmosphere. But we need to take certain events into consideration. For one thing, molecules and atoms experiencing intense friction often become electrically charged from loss of electrons, and other issues. Interestingly, researchers have found that each ice crystal in a noctilucent cloud contains approximately 3 percent meteoric material. However, since the available “meteor smoke” is relatively scanty, noctilucent clouds are generally wispy and thin. They may display an eerie “electric blue” appearance; photos showing these phenomenon appear in Hampton University’s Image Gallery: Noctilucent Cloud Photographs. But so what? Noctilucent clouds are not simply objects of entertainment for scientists. Studying noctilucent clouds offers some promising insights. 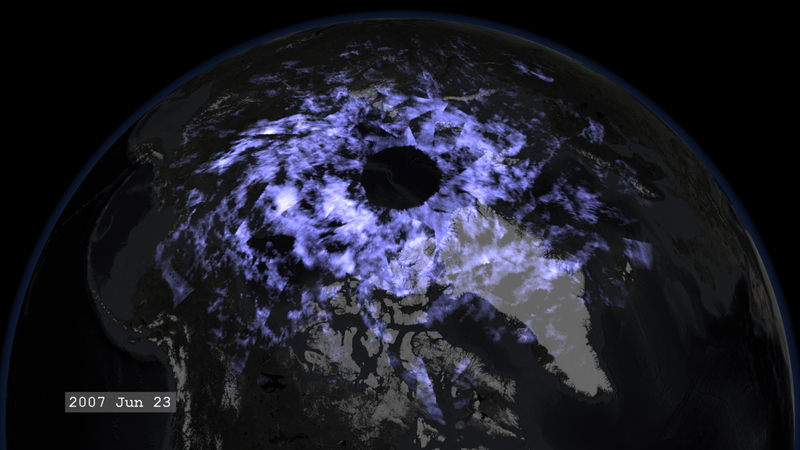 Scientists recently found that noctilucent clouds over one part of the earth have a frequency teleconnection with a different part of the earth. As an example, the Arctic stratosphere is directly connected via frequency with the Antarctic mesosphere. Weather in the Arctic stratosphere produces a ripple effect in the Antarctic mesosphere and in the number of noctilucent clouds. It takes about two weeks for changes associated with the Arctic stratosphere to affect the NLCs over the Antarctic. Clearly, noctilucent clouds are not useful as forecasting tools in this regard. Still, monitoring noctilucent or polar mesospheric clouds should help research scientists in their investigations of the interactions of atmospheric layers around the earth. As is so often the case, researching a new phenomenon leads to other interesting discoveries. This has already happened in researching noctilucent clouds. Very likely it will happen again.